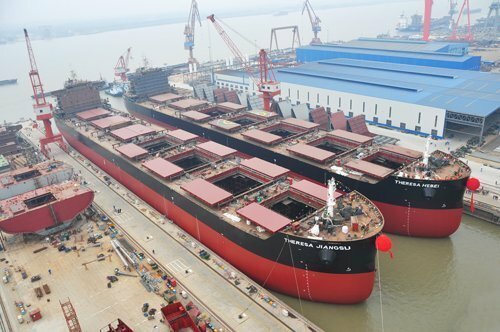 Sainty Marine has announced that it has received rulings from Hong Kong International Arbitration Center (HKIAC) regarding two shipbuilding contract disputes. Sainty Marine signed with Sasa Shipping and Adriana Shipping in 2010 for the construction of two 82,000dwt bulk carriers. However, the two companies refused to take delivery of the vessels in 2012 as they felt the vessels hadn’t met the delivery terms, and applied for arbitration in 2013. HKIAC ruled that Sasa Shipping and Adriana Shipping have breached the shipbuilding contracts. Sainty Marine only has to return $8.6m out of $19.08m prepayment to Adriana Shipping, while Sasa Shipping has to pay $1.37m to Sainty Marine in addition to $9.54m already prepaid to the shipyard. Sainty Marine is also entitled not to deliver the vessels to the two companies. hi there, do you have court case details for this legal case?